It’s finally feeling like Summer in Ottawa! Yellow is a colour I always associate with Summer. I’m not sure if it’s because there’s lots of sun in the Summer (fingers crossed) or because it’s such a happy time of year. Either way it’s virtually impossible to be sad when you’re wearing yellow right? I was thrilled to find this cute and comfy off the shoulder yellow gingham print dress at Old Navy. 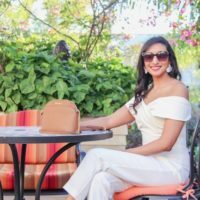 This dress has a fun and feminine feel to it with the off the shoulder ruffled top and the lace detailing at the bottom. I love the yellow gingham print, it’s just perfect for a Summer weekend or BBQ. The dress is made out of a linen and rayon blend fabric so it’s light and fits loosely on the body. 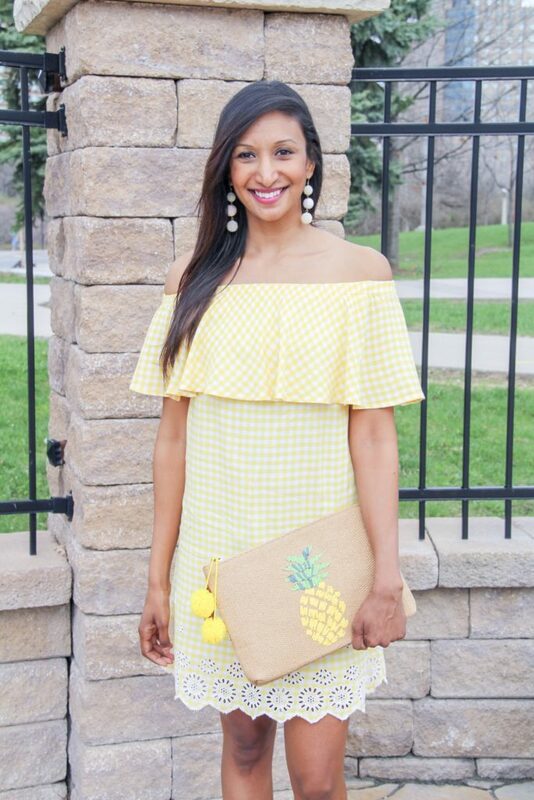 I chose to style this dress as part of a casual outfit and I was so pleased to find this adorable pineapple straw clutch at Old Navy as well. Straw bags, pom poms and tropical accents are trending this Summer and this bag combines them all! To complete this outfit I added a pair of white wedges and some white beaded earrings. My goal in putting this outfit together was to pick up on the colours in the dress. The clutch picks up on the yellow and the earrings and shoes accent the white in the gingham print. This is probably one of my favourite outfits for Summer as I’m a huge fan of bright colours and sunshine 😉 What’s your favourite Summer colour? Mellow yellow perhaps?